These are not just ordinary pumpkin cupcakes. They have little pieces of crystallized ginger in them. That along with being covered in cream cheese frosting make these an awesome treat. You will need a cupcake pan that fits 12 regular size cupcakes. Mix the flour, baking powder, baking soda, salt, cinnamon, and ground ginger in a bowl. In another bowl, beat the melted butter, sugar, and pumpkin until smooth. Mix in the eggs and crystallized ginger. The batter will be nice and thick. Divide the batter evenly into the liners. You will need about 1/4 cup for each. Bake about 25 minutes until the tops are firm and poking them with a toothpick yields a clean toothpick. In a bowl, add the butter, cream cheese, vanilla extract, and powdered sugar. Beat until smooth. Take 1/4 cup frosting and put it into another bowl. Add the cinnamon and milk and blend well. Frost the cooled cupcakes with the frosting. With the remaining cinnamon frosting you can either do what I did in the picture. 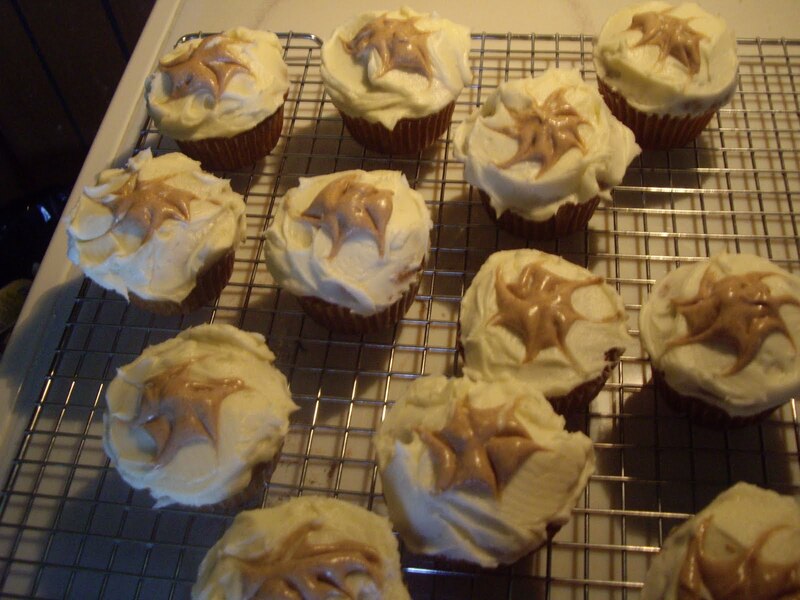 Which is to put small dollops in the center of each cupcake and take a toothpick and draw lines through it to make swirls and look like stars. You can also put the frosing into a pastry bag and draw 2 circles on the top and run a toothpick through the circles to get a spiderweb effect. No matter how you do it, it will be yummy! You can store them for 3 days at room temperature. After that, due to the cream cheese frosting, you need to refrigerate. Chocolate chip cupcakes. What could be better? You can either top these with a chocolate glaze or dust with powdered sugar. I had cocoa sugar so I used that. Also good as is. Makes about 18 regular size cupcakes. Line the muffin pans with liners or grease the cups well. Mix the flour, brown sugar, and baking soda in a mixing bowl. Cut in the butter until the mixture is coarse looking. Mix in the egg and vanilla. Add the milk and sour cream and stir well. There may be some lumps of batter and that’s OK. Fill all the muffin liners with a little over 1/4 cup batter. The cups will be pretty well full. Bake for 23-25 minutes until the tops are firm to the touch and a toothpick comes out clean when poked into the middle of a cupcake. Cool for 10 minutes in the pans. Drizzle with the glaze or sprinkle with the powdered sugar, if desired. These are great chocolate cupcakes. They are very light and fluffy with great chocolate flavor. 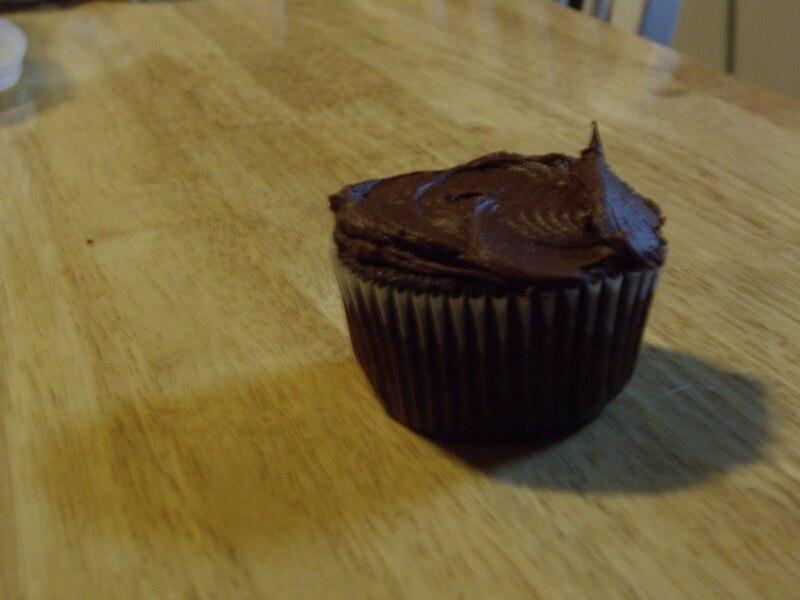 I have frosted these with chocolate frosting, as you see. This batter will make 18 regular size cupcakes, 12 jumbo, or 60 miniature size. So get out your muffin pans and fill them with liners for the type you want. Mix the flour, baking powder, baking soda, and salt into a bowl and set aside. In a large bowl, beat the 8 Tablespoons of softened butter with the sugar until it is smooth. All at once, add the melted butter and cocoa powder. Add the eggs, one at a time. Make sure the first is blended well before adding the second. Add the vanilla extract and beat for a minute when the batter will lighten slightly in color. Add the sour cream and beat until no white streaks are visible. Add half of the flour mixture and mix well. Now add the rest of the flour mix and beat until it is mixed well and batter is smooth. 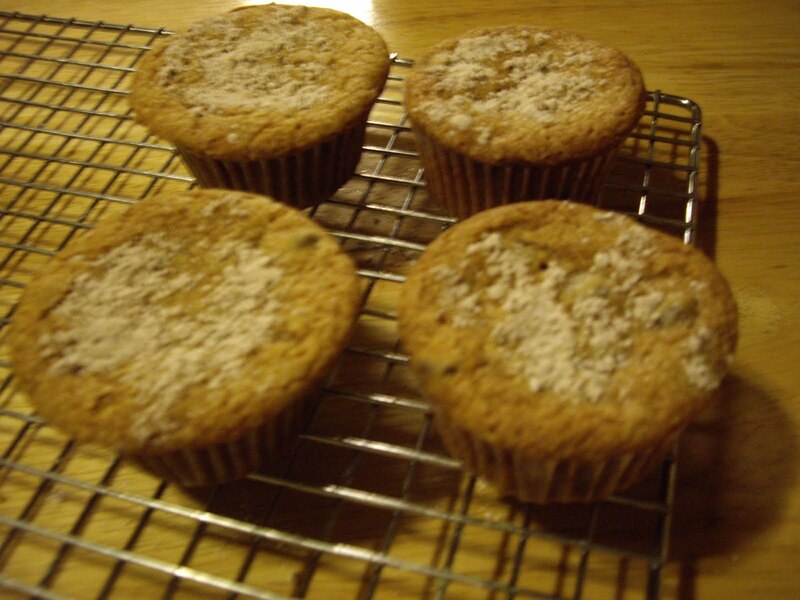 With a spoon or cookie scoop, divide the batter among the muffin liners. You will use approximately 1/3 cup batter for jumbo size, 1/4 cup batter for regular size, and just a couple Tablespoons for the miniature size. Bake in the preheated oven for 20-25 minutes. Check them at 20 minutes. The tops should be form and will test done with the toothpick test. These kind really don’t spring back to the touch test like some cupcakes do. Cool in a rack for 10 minutes and ten out of the pans. Cool completely and frost as you like.